Walking alone late at night is unsettling – and in the dark when nobody is around, even well-known routes can be unsafe. But being out on your own after dark isn’t always avoidable, and telling a friend where you are and when you expect to be home is often a huge comfort. Companion takes this a step further. 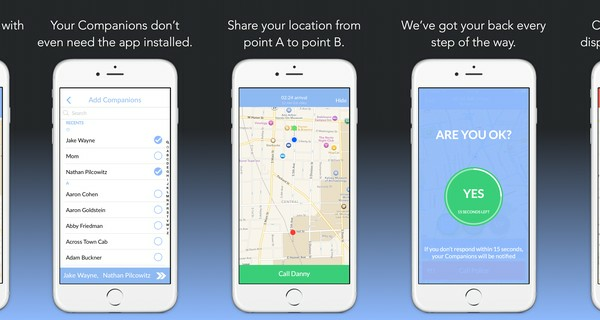 The app allows you to tell any contact in your phone – even if they don’t have the app downloaded – where you are, so that they can track your progress on a map. Users tell the app their destination, mode of transport and chosen contact. During the journey, the app will periodically ask the user ‘Are you OK?’ and if the user doesn’t respond by tapping ‘yes’, the app begins a 15-second countdown before notifying the user’s chosen companion. If the app detects that the user is running, or that the headphone jack has been yanked out, the countdown is also activated. The application was designed by five students from University of Michigan who were worried about the safety of their friends as they moved around the campus at night. They teamed up with app-building company Intellectsoft to make Companion a reality. A notable feature of the app is the ‘I feel nervous’ alert, which allows people to report areas that feel unsafe to them even if there is no emergency at the time. This gives places like universities a heads-up that certain spots might require better lighting or other safety measures such as CCTV. Launched in 2015, the app has already had 500,000 downloads. Get it on Google Play or the App Store and you need never walk alone again.